Making energy out of trash has great environmental appeal. Yet last week’s announcement that a commercial biogas plant is planned for 22 acres at the Philadelphia Energy Solutions refinery complex in South Philadelphia — already considered the largest source of particulate emissions in the city — has tempered the local environmental community’s enthusiasm. According to RNG Energy Solutions, developer of the proposed $120 million plant, it will have the potential to turn 1,100 tons of commercial food waste from the Philadelphia region that otherwise would be burned or sent to landfills into 22,000 to 24,000 gallons (3,000 dekatherms) of renewable natural gas daily, using anaerobic digesters. RNG Energy president James Potter told StateImpact the agreement isn’t a Philadelphia Energy Solutions investment or even a partnership: RNG Energy will enter into a long-term site lease with PES, and the refinery will pay for the biogas plant’s total renewable natural-gas production. Further details of the contracts were not revealed. According to the city, the facility would receive no public financial assistance, although it will be eligible for state and local tax credits because it would be located within a Keystone Opportunity Zone. Clean-air advocates, environmental activists, and city officials said they needed more information about the potential environmental impact of the Point Breeze Renewable Energy facility before making judgments. “Overall, it’s positive,” said Christine Knapp, director of the city’s Office of Sustainability. Philadelphia needs renewable-energy sources to meet its clean-energy and carbon-reduction goals — Mayor Jim Kenney recently confirmed its pledge to meet a 100 percent clean-energy goal as part of the city’s clean energy visionplan to reduce emissions 80 percent by 2050. 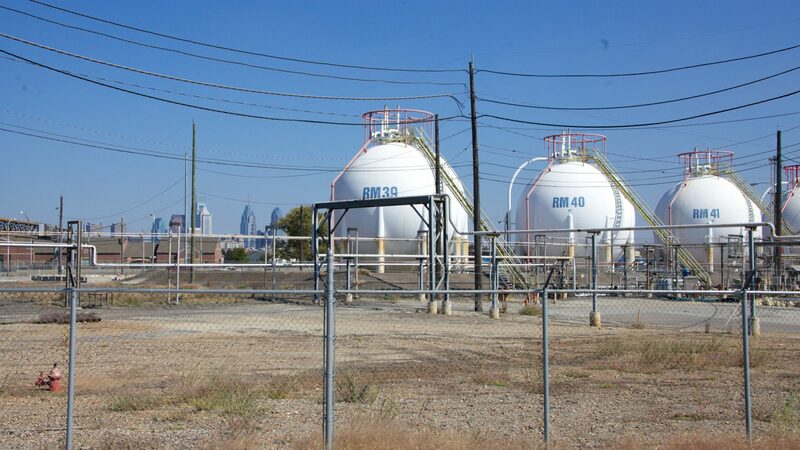 Natural gas from the RNG Energy facility could potentially fuel both the city’s and SEPTA’s fleet. Decomposition of organic material in landfills liberates carbon dioxide and large amounts of methane, a greenhouse gas roughly 30 times more effective in trapping heat in the atmosphere than CO2. “[But] we want to make sure that it’s done appropriately, taking into consideration the neighbors and respecting their concerns. We also want to make sure that it does fit in with our carbon and energy goals — which it does look like it aligns, but there’s still more research we have to do to make sure it does,” Knapp said. Matt Walker, advisory director of the Clean Air Council, a nonprofit that has continuously opposed PES, said that residents need more information about the project, and that state and city agencies must give them the opportunity to engage in the permitting and decision-making process. “While the project could, in theory, lead to reduced methane from landfills in the region, as well as less carbon dioxide from vehicles that use the fuel, it is unclear if there will be any additional pollution burden to the surrounding community, and if so, how much,” Walker said in an email. Environmentalists have campaigned against the PES refinery, saying it has not done enough to reduce air emissions. In this July 26, 2016 file photo, demonstrators called for Philadelphia Energy Solutions to scrap its plans to expand, which ultimately did not gain approvals. RNG Energy’s Potter said the impact to neighbors would be “unrecognizable.” Food waste coming from restaurants, groceries, food processors, universities, and other institutions in eastern Pennsylvania, northern Maryland, southern and central New Jersey, and Delaware into the facility would never be unpacked there and will be processed in two or three transfer stations off-site (at least one of them would be located in the city). Then it would be pumped into 6,000-gallon tanker-trucks and brought to the facility, where the liquid would be moved into tanks and then into one of eight bioreactors, he said. He added that the number of trucks coming in and out of the facility would not be large and would not create further pollution or increase traffic since its location is adjacent to Interstates 76 and 95. Jo CordonHill, an organizer with Philly Thrive, a local environmental group that opposes construction of the biogas plant, was skeptical about Potter’s statements and, overall, about the refinery’s connection with the project. Last year, Philly Thrive surveyed the refinery’s neighbors and found that more than half the 314 respondents had either heart disease, cancer, or a respiratory condition. The group claims local residents’ health issues could be linked to pollution from the PES refinery. CordonHill said it will work to stop approval of the food-waste facility because it benefits PES, allowing it to comply with the annual Renewable Fuel Standard required by the Clean Air Act. CordonHill said that even though PES chief executive officer Mark Smith said the company is pleased to bring clean energy and green fuel for transportation to the region while also adding jobs, the refinery did not commit to reducing its fossil-fuel production or its carbon emissions. “Even though it looks like they’re doing something good for the planet, ultimately their motive is to solidify their business,” she said. Knapp, of the city’s Office of Sustainability, said that while she understands the advocacy community’s frustration about a project could help the refinery stay open, at least it’s good to see that PES is trying to diversify using cleaner sources. 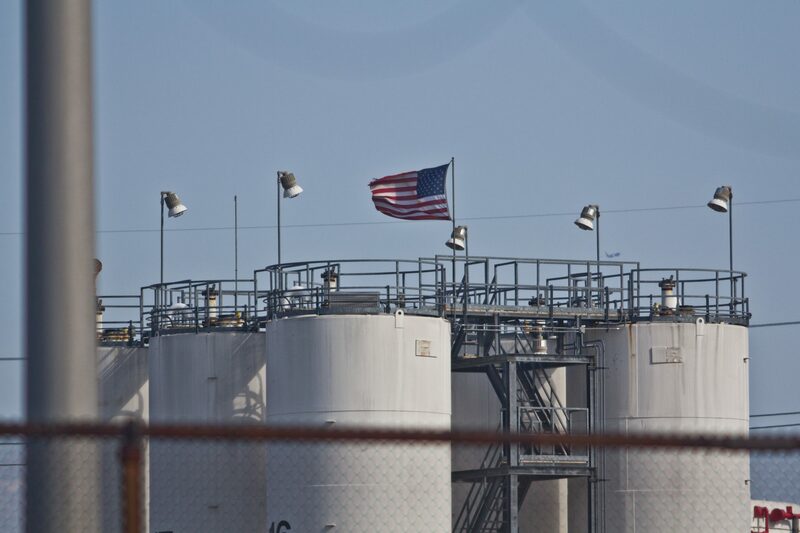 “So I think it’s still a positive in helping the refinery take even a small step in cleaning up their act,” Knapp said. In February, PES filed for Chapter 11 bankruptcy, blaming its economic problems mainly on regulatory compliance costs associated with the federal Renewable Fuel Standard (RFS). The program requires that a certain volume of renewable fuel be blended with gasoline to replace or reduce the quantity of petroleum-based transportation fuel. Some refiners mix gasoline with ethanol. Other refiners, like PES, don’t have their own blending operation and buy credits called renewable identification numbers (RINs), whose market is highly volatile. “This is a smart move for PES, as a merchant refiner, to help manage its escalating RFS compliance obligations,” said Christina Simeone, director of policy and external affairs at the University of Pennsylvania’s Kleinman Center for Energy Policy. Simeone, who has been studying the refinery’s up and downs, said that by creating a long-term renewable natural-gas agreement in house, with credits priced outside the market, PES avoids RIN market volatility, which brings more stability and less uncertainty regarding its compliance costs. Neither RNG Energy president Potter nor PES spokeswoman Cherice Corley would say how many RINs the new facility would generate, but Potter said all of them would go to PES. Corley said the project would generate some RINs but not enough to comply with the requirement. “The project does not solve the flawed RFS for PES,” she said in an email. Ultimately, Simeone said, the refinery faces many other challenges on top of the increasing cost of complying with the RFS requirements: access to cheap domestic crude oil; aging technology and increased competition from modern refineries; and its debt. 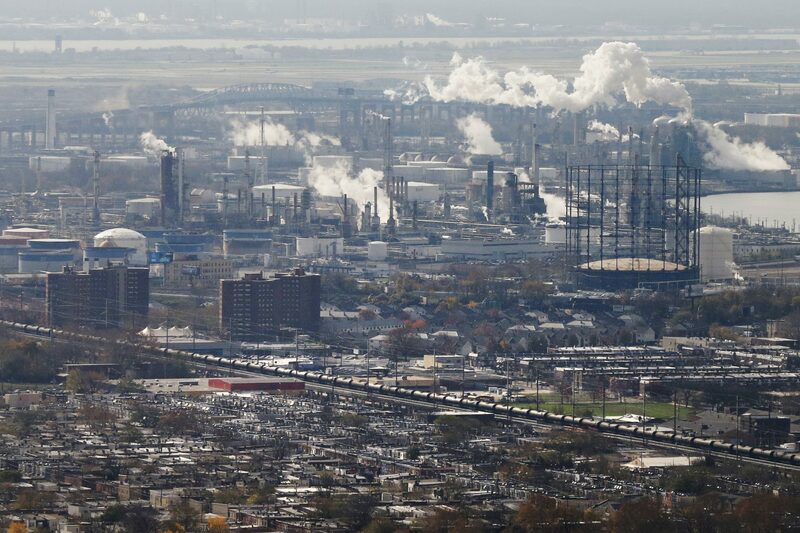 “I think this [project] will help the refinery, but it’s not a silver bullet,” Simeone said. The city knows that the only way to achieve the mayor’s goal of eliminating the need for landfills and incinerators by 2035 is by reducing the amount of organic waste Philadelphians throw into the trash. The Streets Department estimates that food waste constitutes 18.3 percent, or about 240,609 tons per year, of the municipal solid waste that ends up in landfills. About 78 percent of food waste is commercial, coming from restaurants, groceries, and other businesses. Currently, there is no municipal organic collection in the city, mainly because there are no composting facilities with the capacity to accept large volumes of food waste. Business owners are required by the city’s “dumpster bill” to dispose food waste in garbage disposals or arrange for private collection of it. But only a few waste-management companies collect organics, because there are few outlets at which to dump them. Since last year, the Streets Department has been working on a feasibility study aimed at solving the problem. So the prospect of a large-scale, high-capacity, private biogas facility here that not only composts food waste into rich soil, but also rescues the methane in it and turns it into renewable natural gas, is music to the city’s ears. At the outset, RNG Energy would take only commercial food waste. According to its estimates, the Philadelphia metropolitan area — including the city and Bucks, Chester, Delaware, Montgomery Counties in Pennsylvania and Mercer, Burlington, and Camden Counties in New Jersey — generates more than 3 million tons of organic waste per year. Potter, the company’s president, said accepting residential organic waste might come “years from now,” since its collection is more expensive. Esposito said the city is considering municipal organic collection in the coming years. Knowing that there would be a place to take it makes that plan more feasible. To complete the project, RNG Energy still must raise the $120 million needed and get several federal, state and city permits. According to the company, permitting and construction is estimated to take two to three years.